ARP's Harmonic Damper Bolts safety keep the damper locked into place as the crankshaft flexes and twists and the harmonic damper absorbs incredible amounts of kinetic energy. These damper bolts are ultra strong, 190,000 psi tensile strength that exerts maximum clamping force and are made from heat-treated 8740 chrome moly steel with heavy-duty black oxide finish. Available with a 12-point or square drive head. 12-Point Bolt: Features a 1/4" thick, wide area washer and an extra tall 12-point head accepts a deep socket and eliminates the worry of stripping the head. 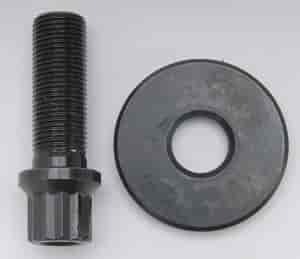 Square Drive Bolt: 1/2" square drive forged into bolt head, accepts a standard 1/2? drive ratchet or breaker bar to facilitate rotating the crank assembly. Does ARP 154-2501 fit your vehicle?